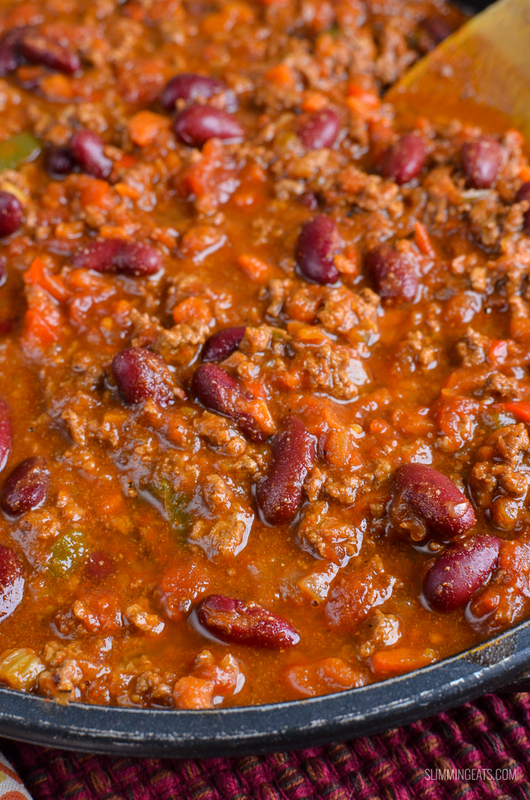 Syn Free Chilli Con Carne – an all time classic family friendly recipe. Pure comfort in a bowl!! 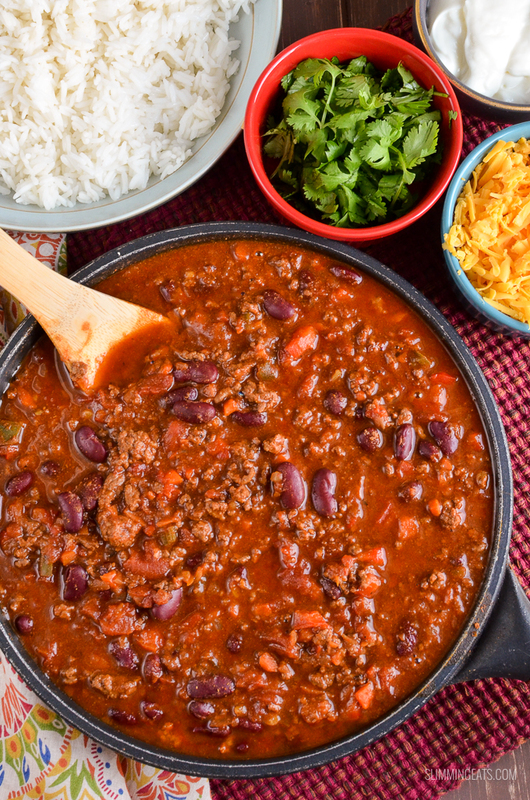 Chilli con carne is one of those meals that many go back to again and again to make, it’s always popular with families and can be served with pretty much anything. Some of my favourite ways to serve it are with the usual rice or syn free chips. But it is also great just with as a layered bowl with various toppings of choice. Hey you can ever use it for a delicious pasta dish – like this yummy Syn Free Mexican Pasta Bake. What vegetables you add to bulk it out, is entirely up to you, I like to use peppers and carrots, and jalapeños. Jalapeños pack a lovely fresh kick to your chilli, which you just won’t get with chilli powder alone. Chopping all the veg in my awesome Nutri Ninja Blender and Food Processor with Auto IQ (click to see me on amazon), it is super easy to make .The auto iq technology feature, means it blends or chops to a set pattern, depending on what it is your are making. Butternut squash or sweet potato is also a great addition, if you have some to use up, there is no rule to exactly what you put in there apart from the spice blend that gives the flavours of a traditional chilli con carne. 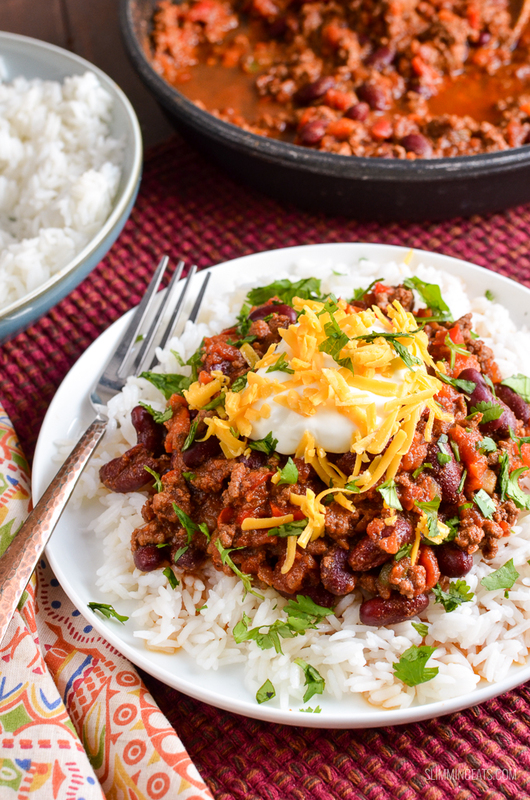 Traditionally in chilli con carne, most use ground beef (extra lean being the choice of course for Slimming World), but don’t stop just there, lean stewing beef or beef chunks can produce a really hearty meal or if you want to make a really healthy version use ground chicken or turkey, like this delicious Turkey Chilli. 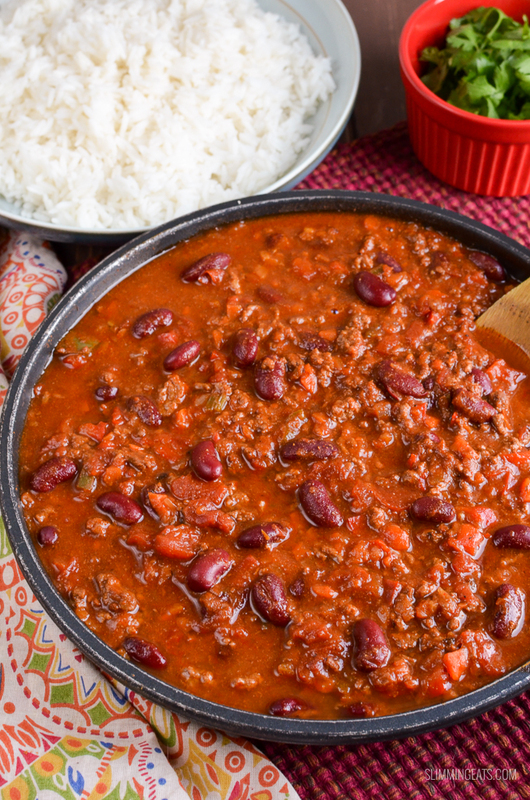 You can even mix up the beans – instead of kidney beans, try some black beans or even a 6 bean medley, like in this Beef and Six Bean Chilli. Wondering what an Instant Pot is? It is basically a 7in1 cooker, and it slow cooks, pressure cooks, sautés, has a setting for soup, chilli, rice, porridge and even makes yoghurt (I haven’t tried that yet). This is one of the best things I have bought and I use it almost daily in one way or another. Hey I even cook my boiled eggs in this – you should see how effortlessly they peel. 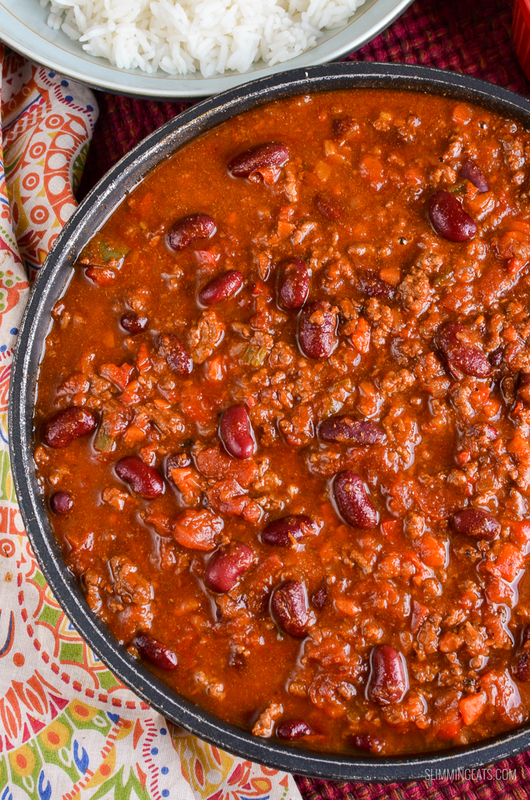 Make this Chilli Con Carne today, full of flavour and one of the best you will taste on Slimming World. Add the spices, chopped tomatoes, tomato paste, red pepper, jalapenos, balsamic vinegar and stock and bring to a boil. Ingredients can vary greatly from brand to brand and therefore it would be impossible to give accurate information. <g class="gr_ gr_185 gr-alert gr_gramm gr_inline_cards gr_disable_anim_appear Punctuation only-ins replaceWithoutSep" id="185" data-gr-id="185">A<g class="gr_ gr_182 gr-alert gr_gramm gr_inline_cards gr_disable_anim_appear Punctuation only-ins replaceWithoutSep" id="182" data-gr-id="182">lso</g></g><g class="gr_ gr_182 gr-alert gr_gramm gr_inline_cards gr_disable_anim_appear Punctuation only-ins replaceWithoutSep" id="182" data-gr-id="182"> </g>double check syn values of sinned ingredients as different brands can vary. Hi Siobhan, I’ve only recently discovered your wonderful blog. 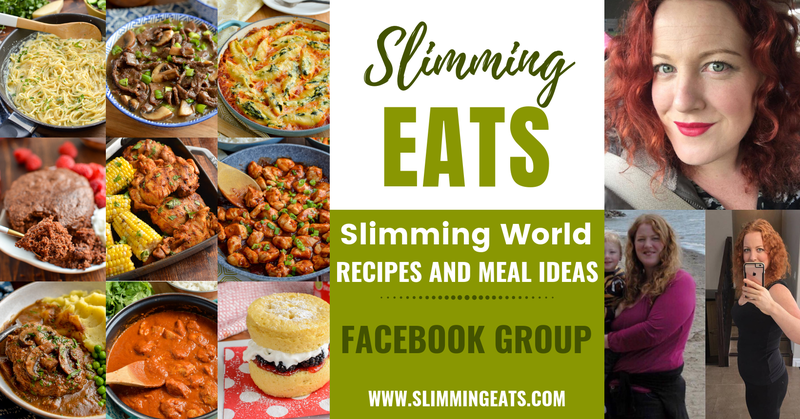 I’ve tried lots of slimming world inspired chilli recipes and this beats them all by a mile! Quote from my partner last night – “I’ve only had 3 mouthfuls and already I give it a 10 out of 10!”. Thanks for all the inspiring posts. 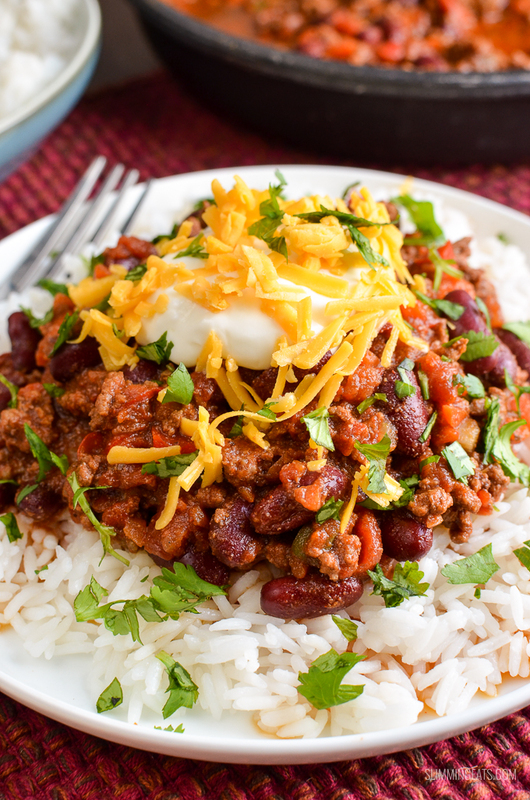 This Chilli Con Carne recipe is so delicious, and easy to make! Another big hit! Simply yummy!! Thank you so much for your support Emma. Made this for 2nd time today and it was just as nice as the 1st time, Devine!!! I left out the pepper so it wouldn’t be spicy as my almost 2 year old loves your recipes too.